The space within the machining zone has been maximized to prevent any tool interference and provide the utmost flexibility and substantically reduce any chance of collision between the cutting tools and the machine. Axis Pathways Spindle Hole Capacity Rexroth roller type linear guide ways ensure the highest accuracy is maintained during high speed machining. These high hardness guide ways provide excellent rigidity and impart very fast linear motion. Spindle Hole Capacity The high speed high precision spindle combines front angular ball bearing and rear single row roller bearing to ensure optimum running and cutting precision even during extended periods of machining. The 8" spindle is designed with a spindle bore of 77mm and accepts bar stock to 65mm diameter. The 10" spindle is designed with a spindle bore of 88mm and accepts bar stock to 77mm diameter. High Rigidity Power Turret New high rigidity BMT power turret and tool holder is fixed using four bolts and a positioning key for the ultimate in stable cutting. 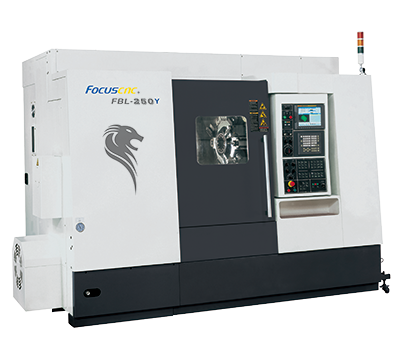 This unit uses an oversized curved tooth clutch to enhance rigidity and accuracy of cutting tools during machining. Built in main and sub spindles are available. Built in spindles do not cause the vibrations imparted by belt drives. Built in spindles offer lower inertia and quicker acceleration/deceleration. An oil cooler is standard on built in spindles for reduced thermal deformation. Main spindel chuck size inch 8" 8" 10" 10"
Sub spindel chuck size inch - 6" - 6"